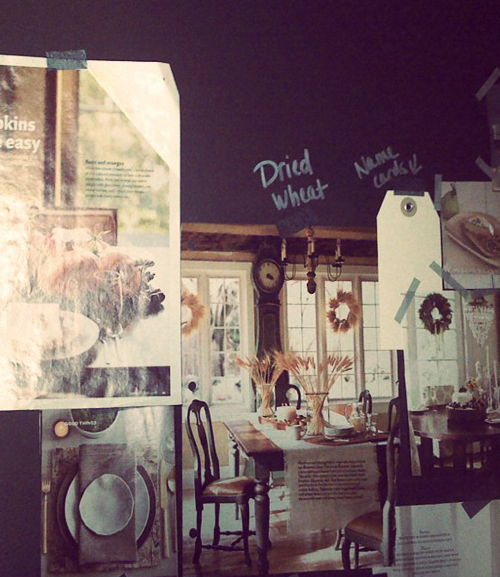 Creating a mood board or design board is extremely easy. I was inspired to make mine by a piece of MDF board that I had left over from another project. The board was gathering dust in my garage when I finally decided to grab it, paint it with chalkboard paint and bring it inside. 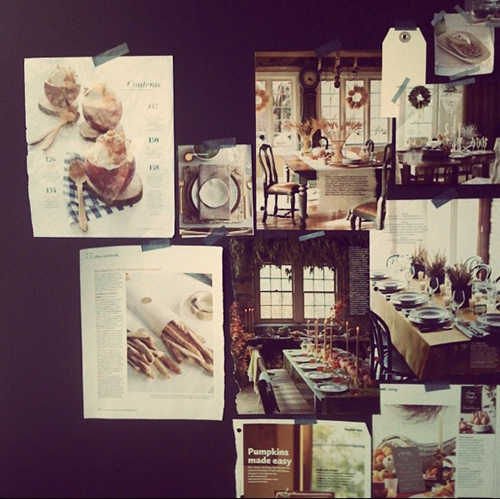 I like the idea of having a design board that can move around - right now I'm pulling photos for a rustic Fall/Thanksgiving table and I can easily move the mood board into my dining room for reference when I am ready to start turning my inspirations into reality. To begin making your board you will need a piece of MDF or plywood which you can pick up at your local hardware store and have them cut to your desired size. I was a bit limited with mine because it was cut from another project so it's larger than I would have liked but oh well - all the more room for inspiration! I chose to paint my board with chalkboard paint. Of course you can choose any color that inspires you, I would say a neutral tone is best so your images really stand out and aren't competing with your background color. I personally love the contrast of the black chalkboard paint against my photos and I can write little notes or ideas in chalk next to pictures. Another option is to paint the base with magnetic paint and then paint over that with chalkboard paint. That way you have a magnetic and writable surface. Originally I only painted one side of my board but I plan to go back and paint the other side - this way if I'm working on a couple of projects I can keep inspirations and clippings on either side of the board and just flip to the side that I need to reference. The entire project was less than $30 and took an afternoon to prepare!